At the end of last year, Mina, Jenn and myself worked closely with the nonprofit organization Out Youth which supports LGBTQ+ youth in Central Texas. We employed Human-Centered Design strategies to learn about the organization’s structure and aim to understand some of their challenges. It was extremely impactful to step out of the corporate world and use our talents to impact the local community. 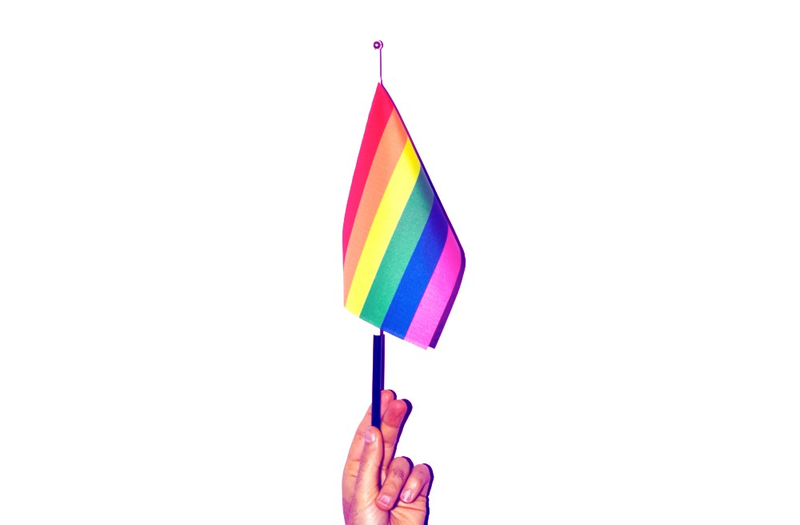 At a time when our nation and local state politics are at a crossroads with LGBTQ+ rights, it is important that we look at our own strengths and skills to actively help others in their time of need. Our team has always been passionate about serving the local community and supporting LGTBQ+ rights. We live in a conservative state where trans rights are under attack, so we decided to focus on a local group that was actively making a difference. In turn, Out Youth welcomed our support, and we soon generated a great dynamic. We found it was key to focus on youth and staff needs during our research stage. 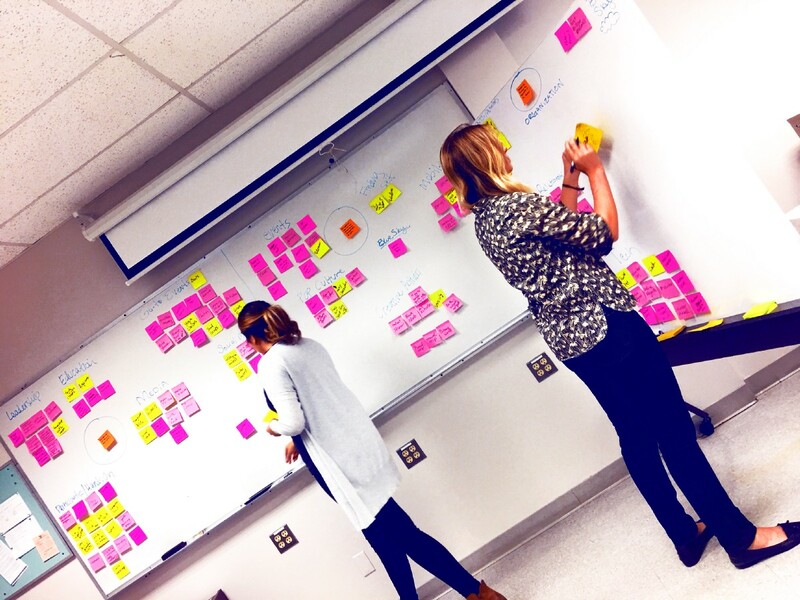 This allowed us to develop deep empathy and craft meaningful solutions. Working with a nonprofit presents its own sets of challenges, and is very different than working with a tech startup or a larger size company. Nonprofits have a slower approach to tackling issues and funding can be mercurial. Most nonprofits have to wait for donations, apply to grants, and fundraise; making a projected budget conservative at best. They have little time or resources to funnel towards restructuring the organization or making sweeping changes. We had to be flexible, adaptable, patient, and open in our communication especially when it came to expectations. When working with nonprofits, always budget an extra 20% for scheduling. But don’t let this deter you, nonprofits need you now more than ever. Building trust is the first step, especially with an organization focused on serving youth. Remember, they may not need another app but they could use an adaptable low cost solution that can be easily updated, and maintained by the staff. Initially we were only allowed to interview staff. Which we later found out were the gatekeepers to the other key stakeholders within the organization. In time, we gained the staff’s trust and the veil was lifted. We were then able to begin research at a greater depth with Youth, Donors, Alumni, Volunteers, and Clinical Care. Soon, it became evident there were untapped resources at Out Youth — the volunteers. In the past, the administration viewed volunteers as a nuisance and a chore. They didn’t have the time to think how they could organize them. With over a thousand volunteers in the database, they had a great opportunity to leverage people power. 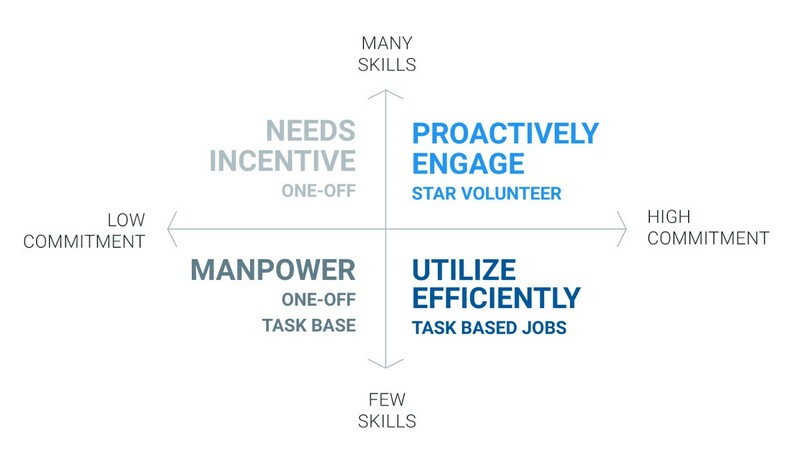 We developed a Volunteer Mentor Strategy to alleviate the stress by organizing, and onboarding volunteer. This strategy not only mobilized the huge pool but freed up the administration’s tasks so they can focus on what they do best: serving Central Texas LGTBQ+ youth. 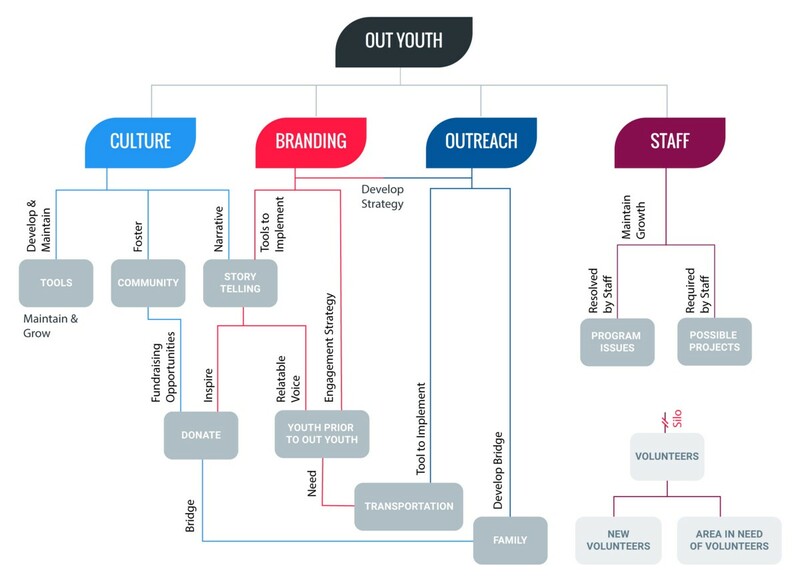 In addition to the Volunteer Mentor Strategy, we developed other solutions to help the nonprofit such as: branding, outreach, voice, online usability, and ride sharing options for underserved youth. The three biggest constraints when working with a nonprofit are having patience, gaining trust and working within their budget. Slowing down the HCD process felt interesting and even luxurious. While we were anxious to get Contextual Inquiries scheduled and projects accomplished, we had to meld with their time frame and availability. At first it was difficult, we thought- do they like us? After adapting to their time frame and building trust, everything fell into place. Money was a huge factor. Nonprofits have a limited budget. Developing low cost solutions that are easy to implement and maintain were essential. 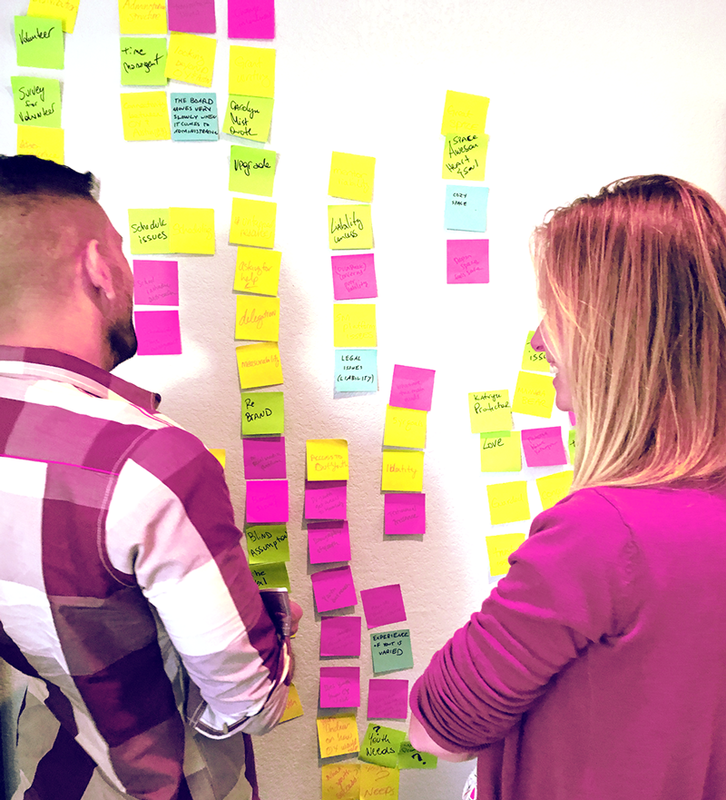 Because of the nonprofits structure and glacial pace, in the future we would construct a different method for sprints that adapts to organizations with a similar framework. It is important to realize when trying new research methods that are not impactful, to quickly pivot and shift the strategy. It is important to show process and tangible deliverables when working on non-digital solutions. We created a printed Review of Findingsbook. 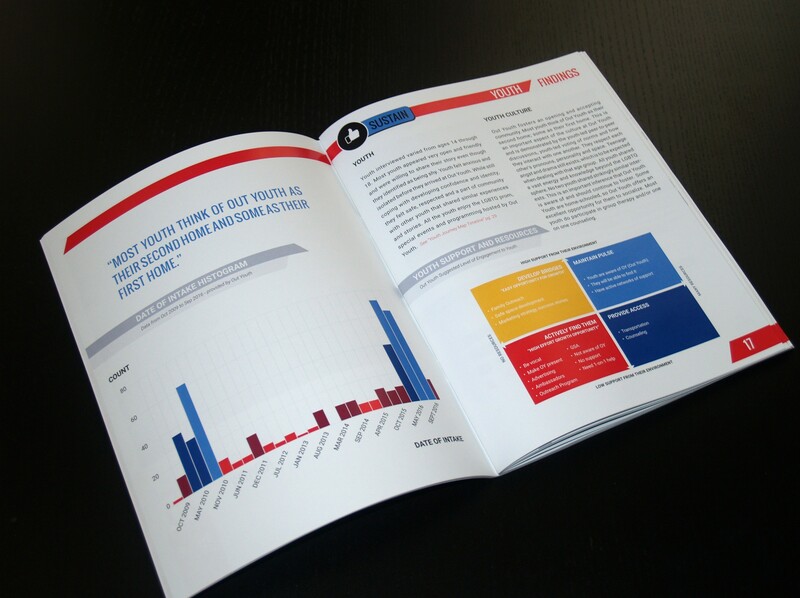 The book included a rating system methodically designed to make it easier for organization’s staff to digest the content and adapt their structure strategically and at a comfortable pace.